Every now and then the discussion comes up in forums where someone gets the idea that they want to run their radiators passively without out any fan power at all. The discussion recently came up again and I decided to dig out some old test data and share a quick blog on what I found back on my V1 test bench while testing a low density double thickness 480 sized radiator. 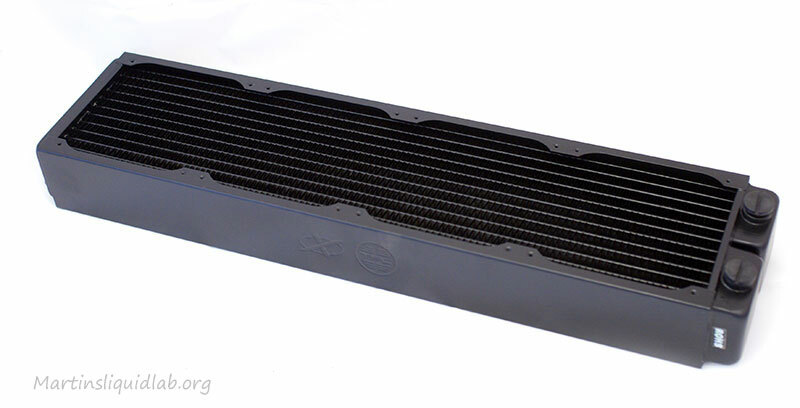 When I was testing my TFC480 radiator back on my V1 test bench, I tried exactly that. I even dialed down the heat to a bare minimum 100 watts to test a very small (perfect conditions) scenario. The TFC 480 radiator is a premium double thickness low density radiator that performs really well with low speed fans, so I figured it would be the pefect test case. So I proceeded to use my very smallest heater, and in the optimal open bench setting with the radiator pointing upward proceeded to test at 100W heat load. I consider an “Average” radiator setup performance to be around a 10C water/air delta and the radiator nearly doubled that on this incomplete test. Perhaps you could get passive to work in a case where you had a power supply pulling air through the case and radiator, but then that’s not really passive is it? It would take a very different type of radiator and much much larger surface areas for passive to work well. While generally most testing is only good relative to the same test bench, it’s also nice if you can get some level of absolute accuracy for a sense of scale and to speak more of a common unit of measure. I do this testing all for hobby, so none of my meters are sent in for any sort of monthly calibration or certification. While I thoroughly enjoy my little testing tools, they are not proven accurate and I simply don’t have a means or desire to do so while hobby testing. It’s very expensive and cost prohibitive at the recreational level I’m working within. I figured the next best thing is to run my own checks using basic tools I have readily available. 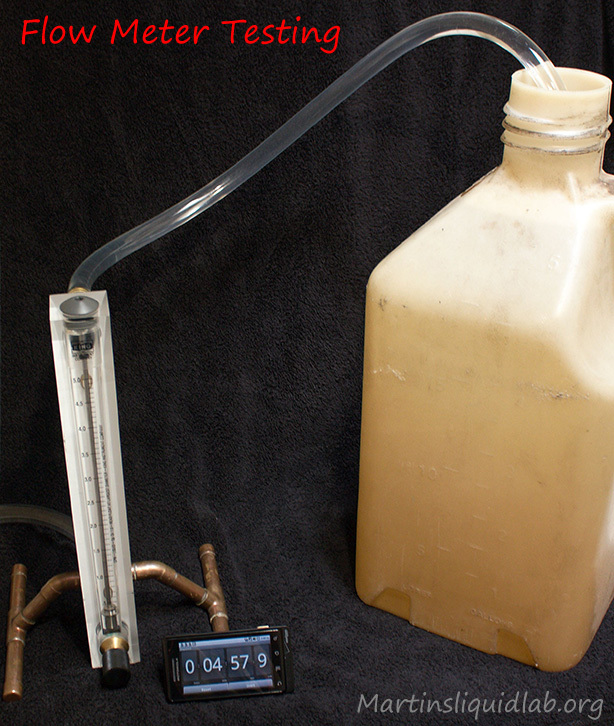 Those basic tools include a graduated container, a stop watch, and section of tubing to be used as a static pressure head water filled tube manometer. In spirit of sharing information, I wanted to include this in a mini “how to testing” blog of sorts. Some of these methods can also be used for casual testing. If you think you might have a flow problem, but don’t have a meter…you can test your flow rate fairly accurately by the method described below. Also if you think your pump is not up to par, you can (with a fair amount of work) also test pumps using tube manometers and bucket/stopwatch for flow rate. I’ve done this before…long ago, but it’s very much a plausible method to extract a more scientific level of data or to test the accuracy of meters. Testing flow rate (Gallons Per Minute) is fairly simple. Find a nice large known volume to fill and measure the time required to fill this known volume. In my case I had an old 5 gallon race gas can that had gallon increments. Mixing 2 stroke gas requires some level of ratio precision, so these cans are a bit more graduated than a normal gas can. If such a graduated volume isn’t available, you could also create your own by using a smaller known volume and marking the container as you fill it up with the smaller known volume container. (A large bucket and an old empty one gallon milk jug would be one cheap and readily available option). 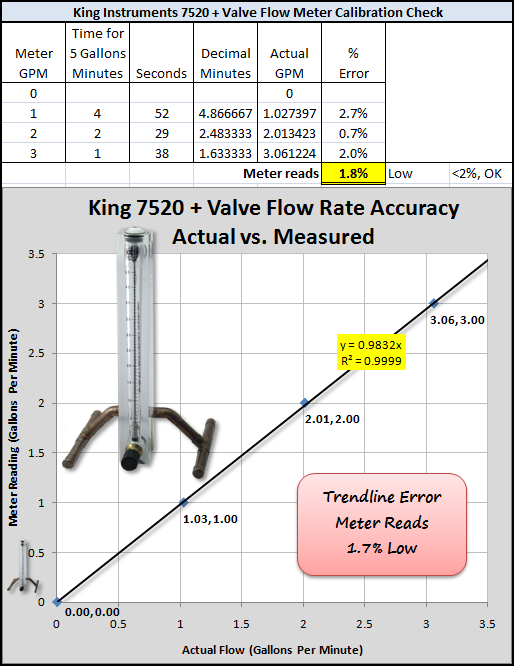 Per the King Instruments Site, the larger King Instruments 7520 should read within 2% of full scale or .02X5 = 0.10 GPM. I got around 1.7% of the measured scale or .06GPM maximum. Flow rate calibration appears to be within specification…very good! Testing lower levels of pressure is also fairly simple. A manometer is nothing more than a pressure meter that measures the pressure difference between two points. If you disconnect the negative pressure terminal, it is now exposed to atmospheric pressure. When you zero out to the atmosphere, you now have gauge pressure. If you fill a column of water on the positive terminal, the net column height (Max level minus level in terminal tube) is the actual gauge pressure differential measured. 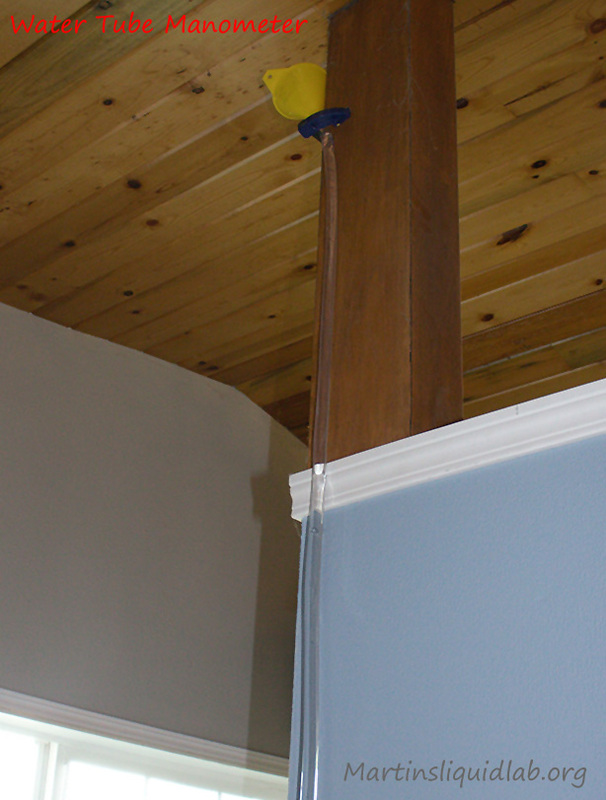 The tricky part is finding something plumb that you can measure a column of water. Note that the tubing doesn’t need to be straight, but your measurement from water level at the top to lower water level needs to be plumb vertical. Excuse the spider webs…:) I just connected a funnel and clamped it to a column in our vaulted ceiling area. In manometer testing, I think there is also some importance in the T line fitting used. If it’s not a large smooth pass through fitting or the fittings are not perfectly identical, there could be some induced pressure differential from T fittings. Like the venturi in a carburetor, if you reduce the sectional area, you will create a vacuum. There is also the possibility with a large opening for the pressure junction that you could get odd flow momentum effects such similar to a pitot tube. I have seen some odd things in the past that makes me a bit careful about these fittings. I think it’s good practice to spend some time on these fittings to minimize disturbance of flow and ensure equal pressure measurement conditions. Water flow does change states and behavior as it increases in velocity, so keeping it down to nice slow speeds may help minimize measurement oddities. I created my own T fittings from 1/2″ copper tubing and brass fittings soldered. This leaves a clean and thin walled 1/2″ ID fitting with minimal turbulence and restriction. They also have very small port openings leading to the manometer in an effort to minimize both restriction and any pitot tube like effects. I have used these custom manometer fittings for some time now and have been pleased with repeatability of pressure drop or pump tests. Looks OK from what I can tell..time for more pump testing.. Same as my round 6 testing and methods with the exception of using a Hardware Labs 140mm SR1 radiator. Seems as though we’re getting more and more 140mm radiator options, so it would be nice to get a feel on how a fan performs on one from a noise perspective. This thread is devoted toward more real world like testing of fans physically mounted to the HWlabs SR1 radiator. Here is the list of fans, sponsors and results currently complete. I plan to do these 140mm fans as well as a few of the top performing 120mm fans on an adapter for 120mm options. The 120mm fans are tested on a BGears slim profile 120>140 adapter. Soo…the 120’s will be getting a small shroud benefit from being further from the radiator fins. In order to see how much if any this diffence means, I’m going to retest my top 140 fans with a shroud and include them in the below chart. 140mm fans only: It’s pretty tight with most of the results within the 3dbA or lower “Barely Perceptible” limit. There are however some fairly notable sound quality issues, particularly with the 7 blade fans at higher speeds including the yates. For low speed, I would tend to favor the Thermalright X-Silent, for high speeds, the Aerocool Shark. 120mm fans on an adapter: This is a bit apples to oranges with the adapter, but it’s fairly surprising just how close 120mm fans perform to 140mm fans on a CFM per dbA ratio perspective. The 140mm fans do have some CFM per RPM advantage and seem to produce a slightly lower frequency tone, but their noise levels were pretty much the same. This makes some of the stronger performing 120mm fans a very viable option on 140mm radiators. I had really hoped the 140mm fans would be a huge benefit over 120s, but I’m just not finding that. There is a good sized advantage to the larger 140mm radiator and reduced restriction, but the gain is in the radiator frontal area, not the 140mm fan itself.